“Climate change will be expensive for Canada and Canadians,” says the report from the National Roundtable on the Environment and the Economy, issued Thursday morning. The roundtable is a group of business leaders, academics and researchers chosen by the federal government to advise Ottawa on how to deal simultaneously with challenges in the economy and the environment. The group models several different economic and environmental scenarios to come up with its costs, but generally assumes that the world will be able to contain global warming to about two degrees by 2050, as promised. 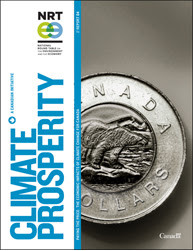 The report is among the first thorough attempts to put a price tag on global warming specifically in Canada. It builds on previous research that mapped out the physical effects of climate change in regions across the country. Since neither the exact effects of global warming nor economic growth over the long run can be pinned down, researchers ran four different scenarios and then had their results vetted by outside experts, said David McLaughlin, president of the roundtable. The results lead to a range of estimates, he said, but they all point to the same conclusion: the longer the effects of climate change are ignored, the costlier they become. “Our modelling … shows there is a risk those costs could not be just higher, but much higher,” the report adds. There’s a five-per-cent chance that climate change costs would spike up to $91 billion a year by the 2050s, if things don’t go as planned. “Getting global emissions down is both in Canada’s economic and environmental interest,” McLaughlin says. Pushing a binding, global treaty that includes all major emitters should be a top priority for Canada, he added in an interview. And on the domestic front, investment in adaptation — by governments at all levels, as well as by corporations — is a pressing need. To calculate the impacts of warmer weather, the roundtable examined what would happen to costs in three different areas: timber, coastal regions and human health. By the 2050s, the effects of warmer weather on forests — pests, forest fires and changes in growth — will cost the lumber industry between $2 billion and $17 billion a year, the report says. The effects will be most dramatic in Western Canada. Along the coasts, flooding and changes in sea levels will cost Canada between $1 billion and $8 billion a year within 40 years. Prince Edward Island’s coasts are most at risk, but costs will also run high in British Columbia and Nunavut. As for health, the researchers looked at the pressure on city hospitals from illness and death due to hotter temperatures. In Toronto alone, they see $3 million to $8 million more in costs by the 2050s. The report estimates that global warming will lead to between five and 10 additional deaths per 100,000 people per year by 2050. The study also looked at the cost effectiveness of a range of adaptation strategies. It found that most strategies were well worthwhile — efforts such as improving forest-fire protection, planting resilient trees, controlling pests, banning new buildings in areas at risk of flooding and limiting pollution. Replacing conventional roofs with green roofs in cities, on the other hand, would reduce heat but at a very high cost. Since adaptation can generally be quite effective, the roundtable recommends the federal government invest in programs that help Canadians adapt and also boost the country’s paltry expertise and research in that area. At the same time, Canada should do what it can to reduce emissions here and around the world, the report urges. Canada’s contributions to global warming are not large, but the effects of other countries’ emissions on Canada are astronomical, it points out. The roundtable also warns decision-makers not to get too hung up on the initial costs of adaptation programs and strategies. “Public and private-sector decision makers more readily see the costs of adapting to climate change as a key barrier to moving forward; less obvious is the cost of not adapting,” the report says.